Today you are one year, one week and one day old. This time last year we were spending most of our time in the bed where you were born, surviving on leftover Christmas cake and trying to work out how to master breastfeeding so you could start growing like you were supposed to. We were still some weeks away from taking down the tree that glowed in the corner of the living room. This year, the tree came down on the 4th January, along with all the other decorations we’d put up for Christmas and your birthday. I think you were a bit confused. You liked the decorations – that tree, the star which sparkled above the kitchen table, the bunting with your gorgeous face printed on its triangles, and of course the balloons. Your eagerness to tell us how much you liked them even led to you vocalising some of your first words: ‘star’ and ‘balloon’ (or ‘bloon’ really). I know there’s lots more you want to tell us but there’s so much we don’t understand yet. I’m not sure if you understood us when we explained that the decorations would be going up again at the end of the year, that it was time to move on and look forward now and that you shouldn’t be sad. I’m excited about this year. I’ve always found January a bit miserable, but it’s pretty much impossible to be miserable when you’re around. Even when you were only a few days old and we saw the world through a blur of exhaustion we could feel the magic your arrival had brought. You were our world, those first few weeks. Everything else ceased to exist and we had to learn how to live all over again. Gradually as time has passed the world has expanded so we can sense ourselves as a family within it – you, me and Daddy, at the beginning of a great big adventure. I say the beginning, but there have been lots of adventures so far! Everyone always tells us how quickly time passes and in some ways this year has raced by. But it also feels like forever – and on the days when it’s just me and you, when I allow myself to see things through your eyes and make the most of every single second, the world seems filled with infinite possibility. I hope it always feels like that – for us but more importantly for you. I want you to know that you can do anything you want to do, be anything you want to be. It’s a cliché but its true. You’ve already grown so much. Not just physically, though that’s pretty amazing. You’ve almost quadrupled in size since this time last year. You’re still getting a lot of your sustenance from my milk – after those tricky first few weeks we went from strength to strength and now I reckon we’re an expert breastfeeding partnership. I actually thought we would have been ready to move on by now, but like so much else I was wrong about that. You are clearly thriving on my milk, and it brings you so much comfort. It brings me comfort too. I love to be able to hold you close, to nurture you as I did for nine long months when you were growing inside me. It keeps me strong as I let you go to get on with all that growing. Your body has got so strong and agile. You’re not quite walking yet, but I reckon that’s mainly because your peculiar one footed crawl is so efficient you’re not quite ready to let it go. I’ve seen the look in your eyes when you find yourself standing, just for a few seconds. Your legs are strong enough to hold you but you don’t quite trust them yet. That cautiousness is emerging as a part of your developing personality. We reckon you probably get it from your Dad, and it’s no bad thing. I think you’re enjoying the increasing control you have over your body and what it can do. There is glee on your face as you manipulate the stacking rings onto their post and choose exactly which toy you want to play with, and how. Watching you play is one of my favourite things to do. You’re so thoughtful and considered, whether you’re brmming one of your cars around the rug or turning the pages in a book. You got some awesome new toys for Christmas and your birthday. You’re starting to get interested in puzzles and slowly making progress with the sorting blocks, though you seem to get terribly frustrated sometimes. I hope your frustration won’t stop you trying new things. You will master them all if you give yourself time. One thing that really makes you happy is making music. We love listening to music at home and sing songs to calm and entertain you. And you’ve already been to lots of gigs and festivals. You quickly learnt how to make sounds from the xylophone, and as soon as you could you began to pull yourself up on the piano to bash out a tune. Not forgetting drumming on pans with wooden spoons and tables with your hands. It makes me smile watching the pleasure you get from the noise you make. I hope you continue to enjoy making music this year, and I hope I keep enjoying it too! If there’s one thing that’s made this past year particularly amazing it’s just how much I’ve enjoyed everything about being your mum. I mean, I’ve known I wanted to be a mum for years, but actually in the last few months before you arrived I began to worry that perhaps I wasn’t ready, that I needed more time for myself. Turns out I really didn’t need to worry. You are such completely delightful company that even in the middle of the night I cherish the time we get to hang out. I’m not saying there isn’t a part of me that longs for a full night’s sleep, but you make it more than worth my while. And in the daytime I never want to leave your side! That’s something I didn’t anticipate for sure. I think my mum (who’s still waiting for you to name her) is a bit disappointed there aren’t more babysitting opportunities. But I have become well and truly attached to you. Whether you’re napping in the sling whilst I write as you are now, playing at my feet whilst I embark on my latest craft project, cosied up under our special babywearing coat as we mission around Brixham or sleeping beside me in the bed we all share, I wouldn’t have you anywhere else. Thank you for an incredible first year little man. I cannot wait to see what this one holds. 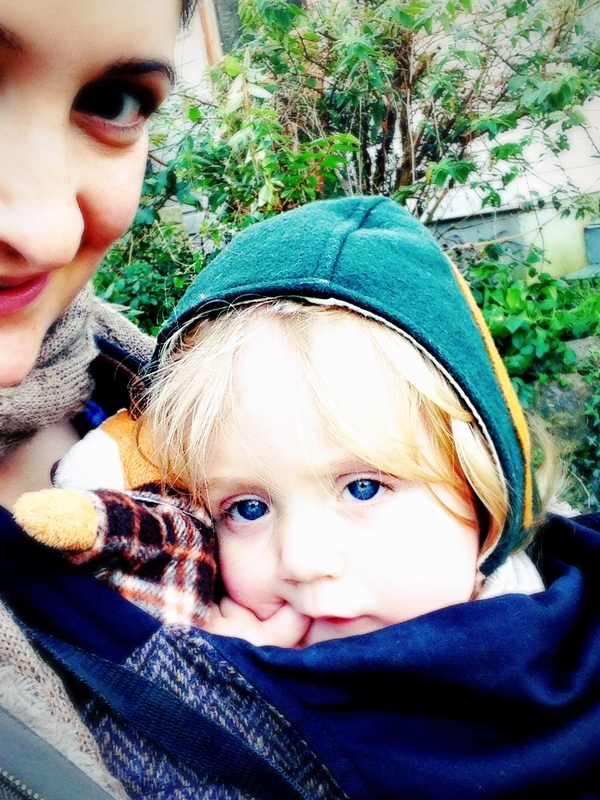 This entry was posted in Sophie is parenting and tagged motherhood on January 5, 2014 by sophieblovett.